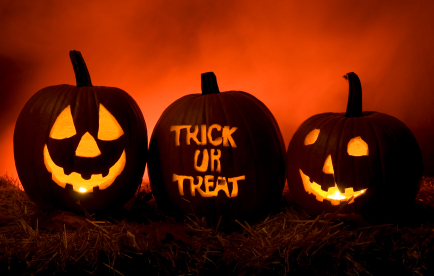 *Children should always go out trick-or-treating with a responsible adult. If you have a group of kids going, the parents should choose two or three of them to go along and keep an eye on things. *Plan a safe route so parents know where their older kids will be at all times. Set a time for their return home. Make sure that they have a cell phone. *Let your children know not to cut through back alleys or fields if they are out alone. Make sure they know to stay in populated areas and not to go of the beaten track. Let them know to stay in well lighted areas with lots of people around. If they are going out alone, they are old enough to know what can happen to them in a bad situation and how to stop it from happening. *Instruct your children not to eat any treats until they bring them home to be examined by you. This way you can check for any problem candy and get the pick of the best stuff! *Make sure your child carries a flashlight, glow stick or has reflective tape on their costumes to make them more visible to cars. *Let them know that they should stay together as a group if going out trick-or-treating without an adult.